Best friends, Benny (Joshua Lively) and Smalls (Zane Crosby), plan to throw an epic party to impress Benny’s crush, Stephenie (Sarah Bower). That night, an accident at a nearby medical testing facility releases a dangerous substance that turns the dead into flesh eating zombies. 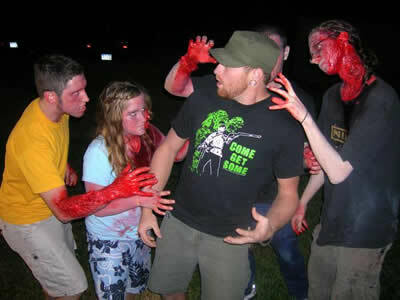 Too busy trying to impress his Stephanie, Benny fails to notice the living dead have surrounded the party. With the help of Smalls and his friends, Benny must save Stephanie and escape becoming zombie food. 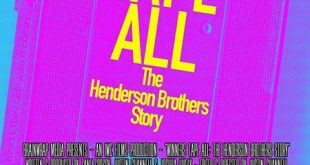 Die and Let Live is the sophomore effort from director Justin Channell and the acting team of Joshua Lively and Zane Crosby. While miles above their freshman effort, Raising the Stakes, their second feature is still hindered by its micro-budget, amateur, independent roots. 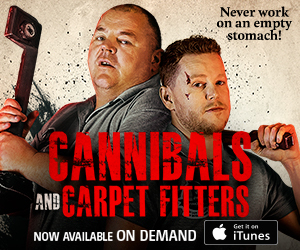 They do make the best of what they have and end up creating a reasonably entertaining and amusing horror comedy. 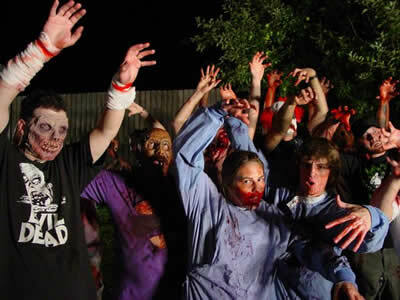 The film has little special effects (zombie make-up and a few blood splatters) and contains a very straight forward approach to film making – no flashy techniques, no overt geeky references. 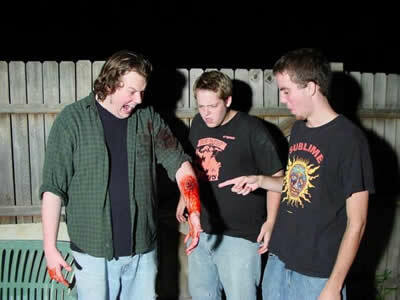 It’s a solid cinematic film from a group of young maturing film makers. Lively and Crosby return and are becoming a promising comedy duo. They have great timing and delivery and are genuinely funny. Geeky and awkward, they are able to secure the audience’s sympathy pretty quickly which helps the film’s plot greatly. They’ve grown quite a bit from their debut in Raising the Stakes and appear very comfortable and confident in front of the camera. Their banter comes across natural and fluid. If these two can keep this up, they could easily become cult icons or even break through mainstream with the right role. The rest of the cast in Die and Let Live fare much better than Channell’s first feature. Many of the cast return for this feature with Jorden Hess as Squints being the standout. In Raising the Stakes he was wooden and grating; however, in Die and Let Live, Hess is much more relaxed and delivers a solid and funny performance. Sarah Bower as Stephanie and Ashley Goddard as Liz bring a pair of solid performances as well and come close to showing depth to their characters. 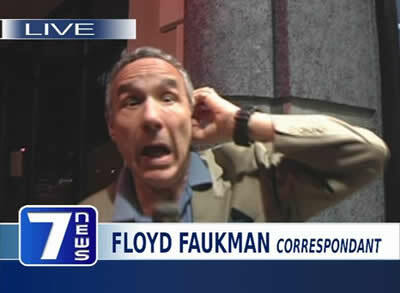 Lloyd Kaufman returns as a reporter sending up the events in his usual manic, zany manner. 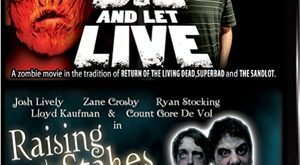 Justin Channell and Zane Crosby provide the script for Die and Let Live that is fast paced and well crafted for this type of film. 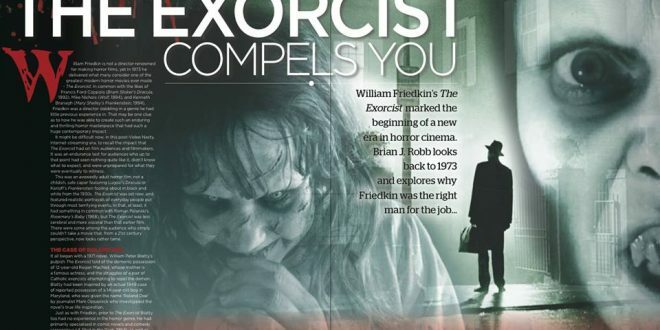 It comes across more like a comedy than a horror film and is never scary. It’s very much a Shaun of the Dead by way of Kevin Smith and Night of the Living Dead. 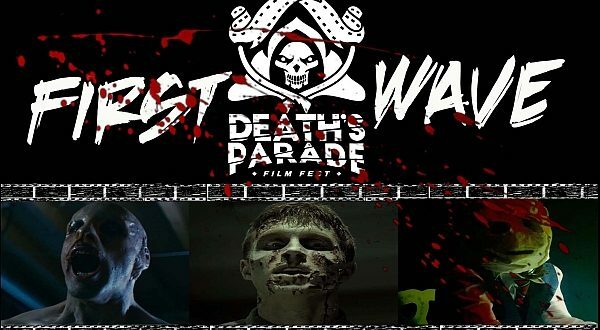 The effects are minimal and each death is set up as a punch line. 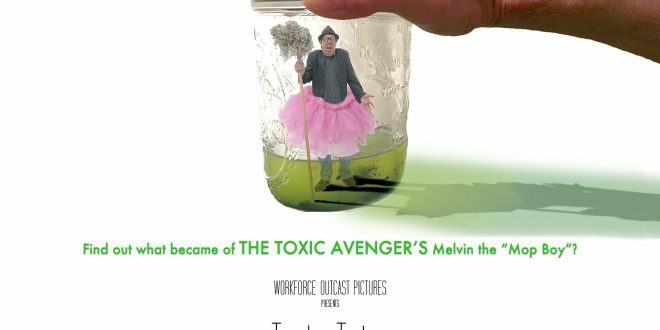 It keeps the story lively, quirky and silly, but diminishes any hope of mood or atmosphere. 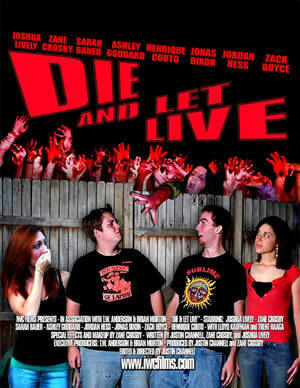 Die and Let Live is another low budget feature from Justin Channell that is a strong improvement and displays a great deal of growth. The film features a strong pair of leads in Lively and Crosby who are easy to root for. 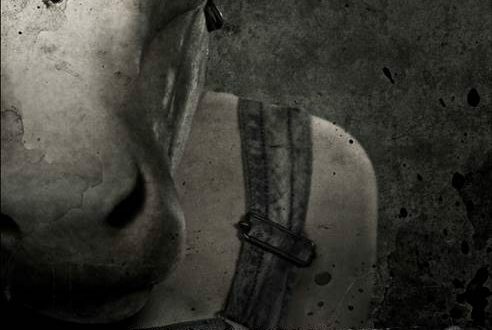 The film is a solid horror comedy that will is easy to watch and is never dull. 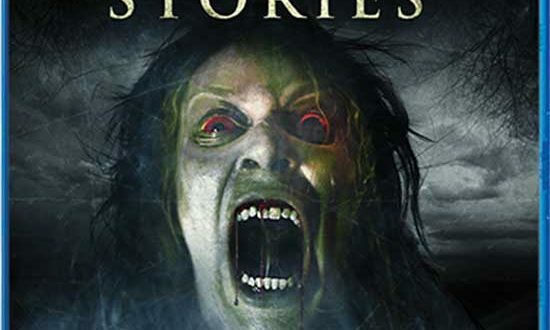 Light on the scares, the zombies are your standard variety, which is fine as they are never allowed to be the focus of the film. Die and Let Live may not be for many horror fans but it is good for a Saturday night with a close group of friends and matching refreshments.